Termites can cause a lot of damage very quickly. These feeding machines work around the clock, so they literally never stop eating (collectively, that is). So they don’t have to be in your home for long to cause serious damage. The longer they are present, the more damage they will do. One of the first things you are likely to notice if you have termites in your garage is a problem with the drywall. You might see brown spots on the drywall or flaking paint. If it’s the sheetrock on the ceiling, you might notice that it’s sagging. You might be able to patch small patches of drywall, but chances are good that the damage is extensive if you have noticed any outer signs of a problem. You will likely need to hire a contractor to replace the drywall and any trim along the base. The best garages have cabinets to keep them organized. Unfortunately, if you have wood cabinets, they are a big target for termites. Termites can eat through the doors, weaken the wood so the hinges fall right off, or chew a hole in the floor or the walls. No amount of repair is likely going to fix those problems. Take this opportunity to upgrade your cabinets since you have to replace them anyway. Get a Slide Lok system or another cabinet system that will help you organize the space better and bring some style to your garage. You may not have a finished garage. Or you may have a drywalled garage and don’t see the damage that is happening to your beams since they are covered. Either way, you are likely to have termite damage to the beams that are responsible for holding up your walls and your ceiling. These items must be replaced to maintain the structural integrity of your garage. Your contractor will likely need to remove extensive portions of wall or other parts of your garage in order to get to the beams or to replace them. You might consider asking your contractor to do a little remodeling work at the same time since the cost will be lower with so much work already taking place. You could have shelves put in, go ahead and drywall if the beams were exposed, or add special lighting, among other things. After you’ve had all that work done to repair your garage, your floors have likely taken a beating. Since you’re already having work done on your garage and are fixing things up, you should consider getting epoxy coatings for your floor. Epoxy garage floor coatings in Scottsdale simultaneously improve the look of the floors while also protecting them. Epoxy flooring is water- and stain-resistant, and it has a shiny, polished look that is a significant improvement over the dusty, dirty look of bare concrete. You can transform your whole garage with garage floor coatings. Termite damage is never a cause for celebration, but you can take advantage of the repair opportunity for a little garage remodeling at the same time. Talk to Varsity Termite and Pest Control to develop a treatment plan that will protect your garage and the rest of your home, and then talk to a contractor about making the repairs and the changes you’d like to see. 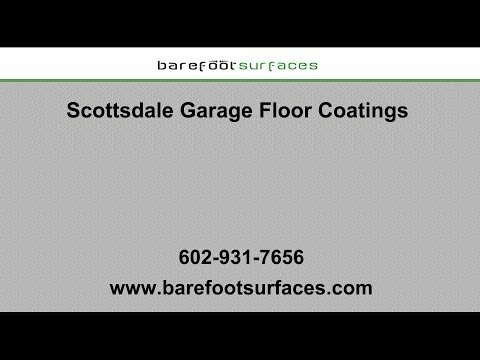 Barefoot Surfaces installs garage floor coatings in Arizona. Epoxy flooring is the perfect complement to your garage remodeling. The floors will have a beautiful, polished sheen that will make your garage look cleaner and more sophisticated. These garage floor coatings will also make it easier to keep your garage floor clean and free of stains. Contact us in Arizona today to get a free quote for garage floor coatings to update your garage.